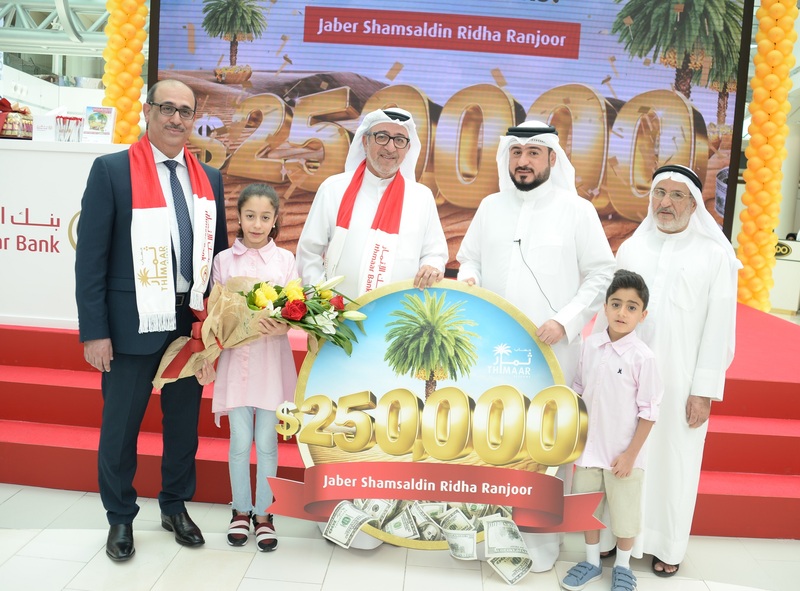 Jaber Shamsaldin, a Bahraini father of three, took home a US$250,000 cash prize after becoming the latest winner of a Thimaar grand prize from Ithmaar Bank, a Bahrain-based Islamic retail bank. Thimar, a prize-based savings account, rewards Ithmaar Bank customers who save using the account with a chance to win up to 4,015 prizes totalling US$3,170,000 throughout the year. The US$250,000 cash prize was presented by Ithmaar Bank Deputy Chief Executive Officer – Banking Group, Abdulhakeem Al Mutawa, at a ceremony held at the Seef Mall and attended by other Thimaar winners, as well as Ithmaar Bank Assistant General Manager – Head of Retail Banking, Mohammed Janahi, and other members of the Ithmaar Bank management team. “I am very happy to win the grand prize of Thimaar,” said Shamsaldin. “I have been banking at Ithmaar Bank for many years because of the fast, friendly service, along with its online offerings and large number of branches across the Kingdom which make it convenient for me to carry out my banking transactions,” he said. “I have also been saving with the Thimaar saving account for a long time, and this prize money comes at the perfect time for me,” said Shamsaldin. “I am glad that, finally, my wish to win a top prize came true this year,” he said. “On behalf of Ithmaar Bank, I would like to congratulate Jaber and his family, as well as all the other Thimaar winners,” said Al Mutawa. “In line with the Bank’s customer-centric commitment to delivering a superior banking service, we work hard to improve the Thimaar savings account as part of the Bank’s commitment to listening closely to its customers’ requirements and actively responding to their feedback. We are pleased to be able to bring so much joy and prosperity to so many families in Bahrain,” he said. In 2018, Thimaar offers its Thimaar account holders 4,015 prizes – one of the highest by any bank in Bahrain. Ithmaar Bank also increased the total prize purse to US$3,170,000, including three grand prizes of US$250,000 each, making it one of the largest to be won in the Kingdom. Every BD30 maintained as an average monthly balance qualifies a customer to enter the draws. The more customers save, and the longer they maintain balances in multiples of BD30, the more opportunities they have to win.